Army Cyclist Corps / 8th Armoured Car Company Royal Tank Corps Superb Grouping. A superb archive of badges worn by Private Archibald H Dall during the Great War and early post war years. Comprising: Three personal ID Dog Tags, one worn as a wrist band ACC ( Army Cyclist Corps). ... ACC Cap, Collar and Pair of Shoulder Titles. ... Pair Cyclist cloth slip on titles, these embroidered onto KD backing cloth... Rare pair of brass 8/ACC (8th Armoured Car Company) shoulder titles, 8th Armoured Car Company Pagri Badge. .... 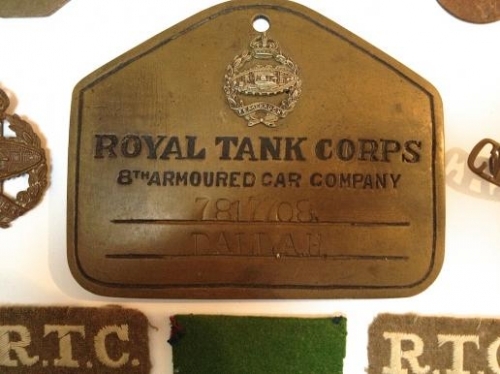 Pair of brass RTC (Royal Tank Corps) shoulder titles. .... Pair of saw on RTC cloth shoulder titles, these white embroidery onto khaki. .... Royal Tank Corps 1924 pattern brass cap badge. .... Bed Plate / Duty Plate 8th ACC Royal Tank Corps stamped with number and name. Overall condition is good untouched condition.